Most moms remember giving their babies their first solid food like it was yesterday, probably because it was such a huge mess! Moms quickly learn that feeding a baby requires four hands: one to hang on to the bowl, a second to hold the spoon, a third to entertain the baby, and a fourth to clean up the mess. So with no free hand to contain the mess, it quickly goes everywhere—on the baby, on the high chair (a gigantic drip catcher with dozens of nooks and crannies), on the floor, and on Mom. A new feeding bowl makes this whole process a lot easier—and neater. With the Baby Dipper bowl, you can feed your baby with one hand. The bowl is triangular-shaped and stays where you put it. You can use your free hand to clean or entertain your baby, or to keep your baby’s hands out of the bowl. Toddlers can see through the transparent sides of the bowl, and so they concentrate on getting the food onto their spoons and into their mouths. The Baby Dipper feeding set prevents the frustrations of chasing the food around the bowl and the bowl around the table! 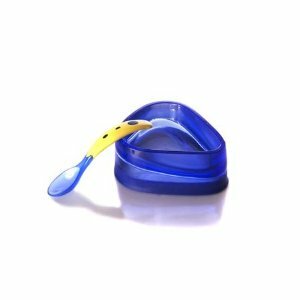 You can buy the Baby Dipper bowl, spoon, and fork set at BabyDipper.com for $12.95.